Victoria Water & Wastewater Project – Village of Victoria, PE | Engineering Technologies Canada Ltd. The Village of Victoria, PE is a quaint, rural village and picturesque tourist destination with many period buildings, artisans, restaurants and a bustling waterfront. Residential lots were subdivided in the mid 1800s and most are not large enough to accommodate modern septic systems. Sewage flows from many commercial establishments greatly exceeded the on-site sewage disposal capacity, requiring expensive pump-outs. 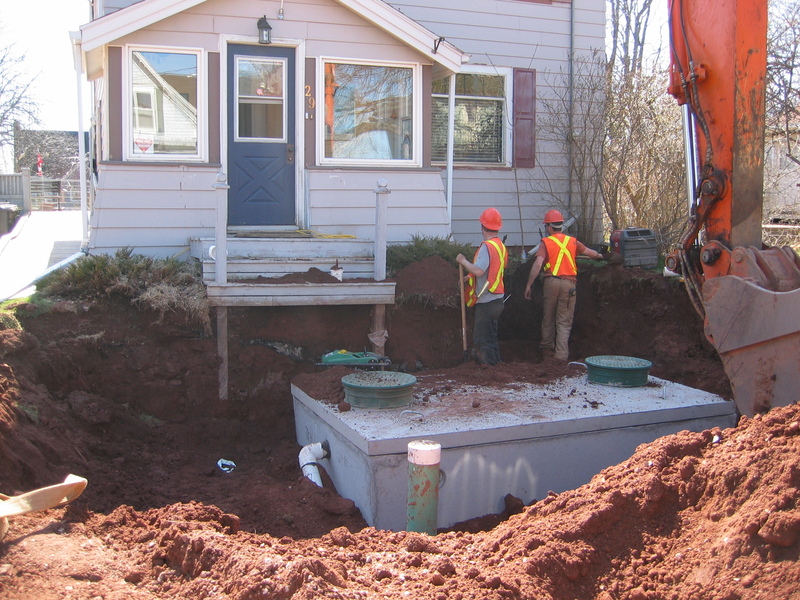 New residential and commercial development was on hold until the Village solved its septic problems. Public health, the environment, and property values were threatened if a viable solution was not found. 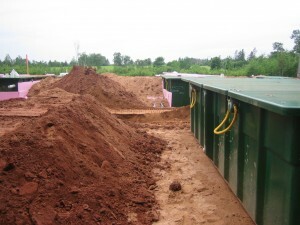 The Community of Victoria retained Engineering Technologies Canada Ltd. (ETC) to investigate conventional and alternative waste-water management options, and in 2005, to design and oversee the implementation of a new central sewage collection and treatment system. STEG primary treatment tanks were installed at all connections to the sewer. Orenco Advantex treatment modules being installed. 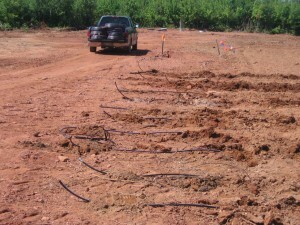 Geoflow Subsurface Drip Irrigation system being installed. • To find a solution to the sanitation problems in the core area of the Village due to failing septic systems and expensive holding tanks. • To provide affordable (life cycle basis), sustainable and effective wastewater management which would allow the Community to grow and develop. • To eliminate the direct discharge to the harbour from the sewage system servicing the Wharf. • To protect Victoria’s central water supply wells from possible contamination. • To reduce water consumption and to reduce the overall demand on the Village’s central supply wells. • Watertight, septic tank effluent gravity/pump (STEG/STEP) collection system used to provide primary treatment at the source and prevent inflow and infiltration. • Land based effluent dispersal (LBED) systems avoided the need for a direct discharge. • Only a part-time operator is needed – telemetric control panels and monitors reduce operator labour costs. • System is modular, and can be easily expanded as the Community grows. • Nitrate output to groundwater reduced by 58 per cent. 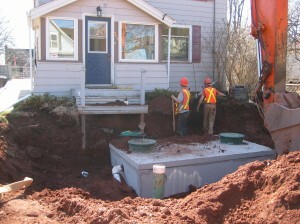 • Community wide, low-flow toilet retrofit program reduced water consumption (sewage generation) by more than 6 per cent. • All water utility customers were metered. The project won a 2011 FCM Sustainable Communities Award in the Water Category for the Village of Victoria and Engineering Technologies Canada Ltd.
Kelly Galloway, P.Eng. also received an award from Engineers PEI for her work on this challenging project. “The ETC team has distinguished themselves by setting the high water mark for STEP/STEG [collection] systems on PEI and Atlantic Canada”.